Successfully Added MX10 Android TV Box - Android 8.0, 4K Support, 3D Media Support, WiFi, Quad-Core, 4GB RAM, DLNA, Google Play, Kodi TV Support to your Shopping Cart. With the MX10 Android TV Box, you’ll be able to enjoy all the latest Android features straight from your big screen TV. This stunning TV box comes packed with some remarkable hardware, allowing you the tackle the latest mobile entertainment. With its Quad-Core processor and whopping 4GB RAM, this Android TV box treats you to a powerful performance. Along with its Android 8.0 Operating System, this Android Media Player delivers a smooth user experience without ever encountering any lag. This Android TV box packs 32GB of internal storage that lets you store plenty of files and media. For those of you who need even more, your Android Media Player comes with a 64GB SD card slot. With all this memory at hand, you won’t have to worry about running out of storage any time soon. To further increase your overall user experience, this Android TV box supports DLNA for easy file sharing as well as Miracast and Airplay. It even comes with WiFi support that lets you browse the web from your TV set. By supporting 4K media files at 60fps, this Android TV Box truly treats you to a media experience like no other. From now on, you can enjoy stunning visuals and breathtaking details while watching films, series, and sports games. Your 4K TV box even supports 3D media – truly treating you to a cinematic experience. Whether its 3D games, 4K movies, or TV Apps – this Android Media Player supports it all. You’ll have access to Google Play and Kodi TV thanks to which you’ll never have to worry about feeling bored again. 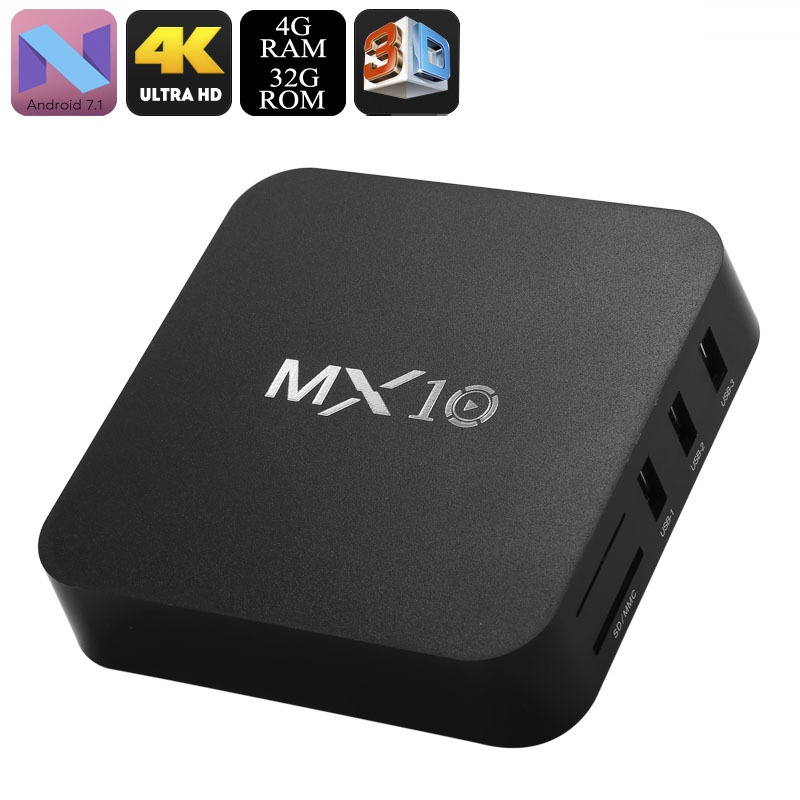 The MX10 Android TV Box comes with a 12 months warranty, brought to you by the leader in electronic devices as well as wholesale Android Media Players..